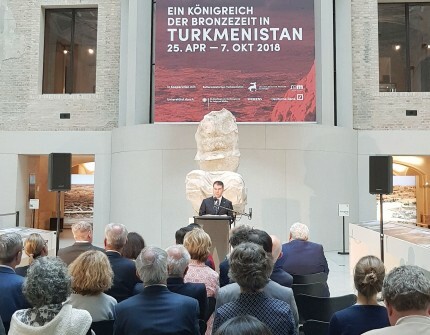 On August 31, 2018 the Embassy of Turkmenistan in Federal Republic of Germany with the assistance of Berlin Museum of prehistory and early history organized event called «Margiana – the kingdom of Bronze Age in the territory of Turkmenistan» in the framework of the motto of year 2018 «Turkmenistan - the heart of Great Silk Road». The representatives of Federal Chancellery of the Federal Republic of Germany, Federal Ministry of Foreign Affairs, Federal Ministry of Economy and Energy, the heads of diplomatic missions accredited in the Federal Republic of Germany, academia, scientific and cultural community members and Turkmen diaspora participated in the event. The director of Berlin Museum of prehistory and early history - M. Vemhoff delivered a speech in the event. He told about archaeological excavations, living conditions of kingdom population and explained how Margiana – the kingdom of Bronze Age maintained relations with neighboring and other countries in different regions. The Ambassador of Turkmenistan in Federal Republic of Germany – T.Atayev addressed with welcome remark. In his speech, he explained how Margiana was home for advanced culture of Bronze Age 4000 years ago, it was situated in the South of Turkmenistan maintained political, trade and cultural relations with the rest of Ancient world and coexisted with such civilizations as Mesopotamia and Egypt. The significant role of Turkmen people in initiating and active functioning of the Great Silk Road and contribution of modern Turkmenistan to revive the Great Silk Road by implementing large Trans-regional transport and energy projects was emphasized. The excursion after welcome remarks was organized and reception dedicated to this event was also held later. It is important to underline that, this exhibition is held under the motto of this year «Turkmenistan - the heart of Great Silk Road» provides opportunity for numerous foreign visitors to get familiarized with rich history and culture of our nation. The numbers demonstrate the level of high interest expressed by visitors and the number of visitors has reached approximately 270 thousand in very short period of time. The exhibition will last until the 7th of October in Berlin and then it will move to Hamburg. The exhibition will continue its work in Hamburg Archaleogical Museum in November this year and from March to June, 2019 in Reiss Engelhorn Museum in Mannheim.